Need advice regarding Dust Cartridge Filter Replacements? JK Filters specialise in supplying, installing and maintaining Cartridge Filters to companies of all sizes throughout the UK. We have a range of Dust Cartridge Filter Replacements available for immediate delivery and at competitive prices. The wider application of Cartridge Filters in the 1990's forced the development of sophisticated technical medias to allow the design to be applied to a much wider range of duties. 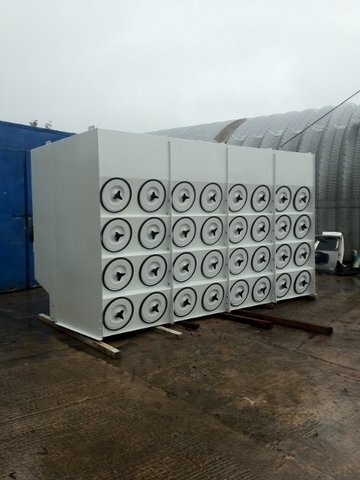 Spun polyester and PTFE laminated felts enabled the use of these filters in the food and pharmaceuticals industries and these units are now developed to a point where they offer a very low cost solution to a very wide range of dust control applications. The JK Filters Reverse Jet Cartridge Filter employs state of the art media options and a top line venturi assisted cleaning system in a robust heavy duty housing at very competitive prices. Inlet shrouds to prevent direct impingement onto the top tier of elements dust containers or screw conveyor /rotary airlock dust discharge. A complete range of instrumentation and control gear to suit every process requirement. Our Dust Cartridge Filter replacements are always in stock and available for immediate delivery. For more technical information and help deciding which Dust Cartridge Filter replacement is right for your needs contact us direct on 07801 741 430. For more information regarding our Cartridge Filter Replacement then please don't hesitate to contact us today. Call us on 07801 741 430 or fill in our online enquiry form below to discuss your industrial cartridge filter requirements. JK Filters have a team of fully skilled service engineers that can carry our servicing & repairs to most dust extraction filters and dust extraction systems. J K Filters offer full LEV Testing and Examinations for only £250+ vat per day. See a brief example of our work history, Dust Extractors, Cartridge Filters and Extractor Production.